by Tanushree Poddar.Indiaink, Roli Books. Marrying someone is like opening a book midway; you really don’t know what went on in the life of your spouse before you arrived. Curiosity, however, must have got the better of Tanushree Poddar when she saw the camaraderie between her Armyman husband and his National Defence Academy (NDA) mates. She goaded and cajoled him to recollect and narrate his experiences of his training, often taking notes surreptiously. This book is a tribute to everyone who has either taught or braved the tough training there. 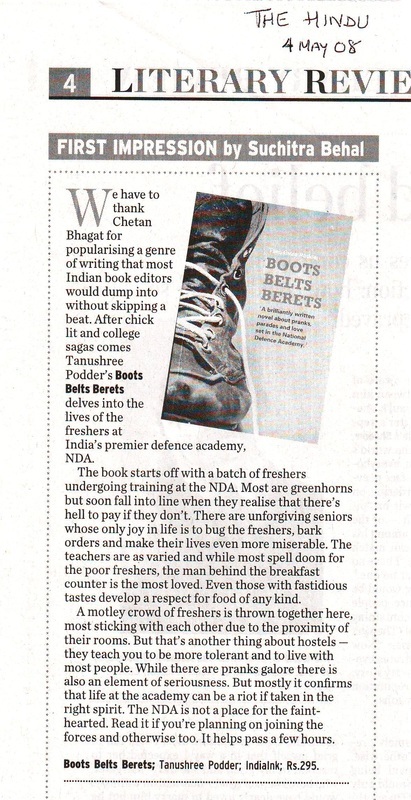 The book comes at a time when recruitments to the armed forces are on the decline. One reason could be that the books hitherto written by the bigwig insiders and know-all outsiders have been too somber for anyone other than the most serious reader. 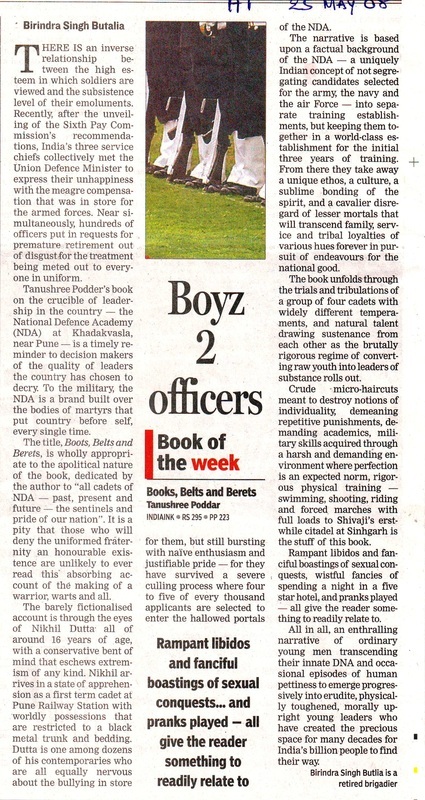 With this book, which is an account of four cadets who stuck through thick and thin to survive the gruelling schedule at the famous NDA at Khadakvasla, near Pune, the Army just might learn to take things in a little lighter vein. Based on the experiences of her husband and his colleagues, the writer recounts the growing up of four teenagers from greenhorns to bravehearts. So, while we all get to "read a few chapters" in the life of an officer, the book also serves to demystify what goes on behind the prestigious confines of the haloed institute. The narrative is set in the 1970s, when actors Jaya Bhaduri, Rajesh Khanna and all things foreign were the rage. Coming from diverse backgrounds, the quartet goes through the rough and tumble of the ragging which includes puttie parades (endlessly changing gear), front-rolling down corridors and going to the seventh heaven (hanging from the wire mesh of your room’s ventilator for dear life!). The instructors add to their academic woes with extra-curricular activities such as swimming and diving, horse-riding, firing, endless drilling and an assortment of sports. Like most teenagers their age, food, girls and lazing around is what they long for. And although the academy offers a Spartan lifestyle, they manage to binge over the mess food and fall in and out of love with the very few eligible females of the human species found on the campus. Although the characters are not really well filled in and the narrative staccato at places, it goes to the credit of the author that the frailer and more humane sides of our officers and men have been revealed. This book tells the inside story of life in one of the countrys foremost military training establishments the National Defence Academy. 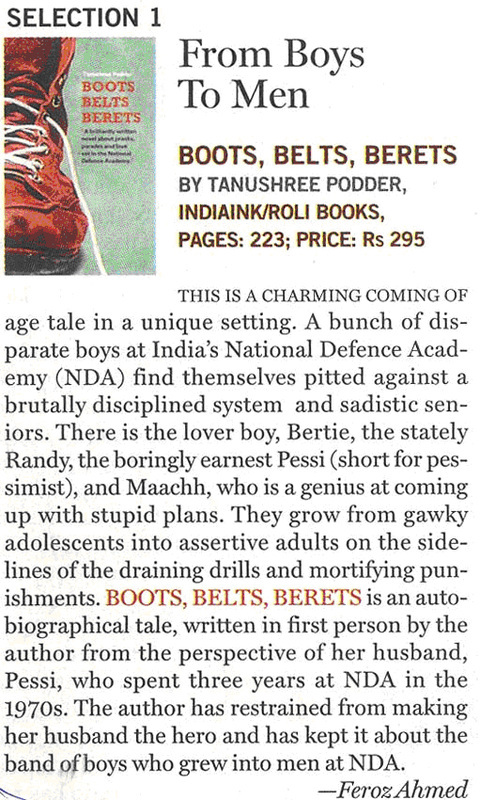 If a novel could be written the way the Defence Ministry wants, Boots Belts Berets fits the bill. This may be the answer to the Ministry’s huge spending on advertisements to attract officer cadets. 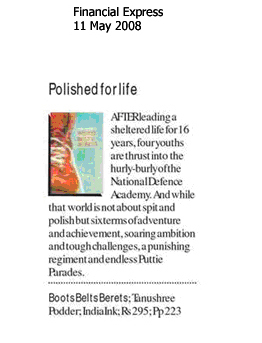 The descriptions and details provided in the book evoke such a perfect picture of life inside a military academy, that even before students finish reading it their minds would be roaming around the campus of the country’s most elite training academy — National Defence Academy (NDA). 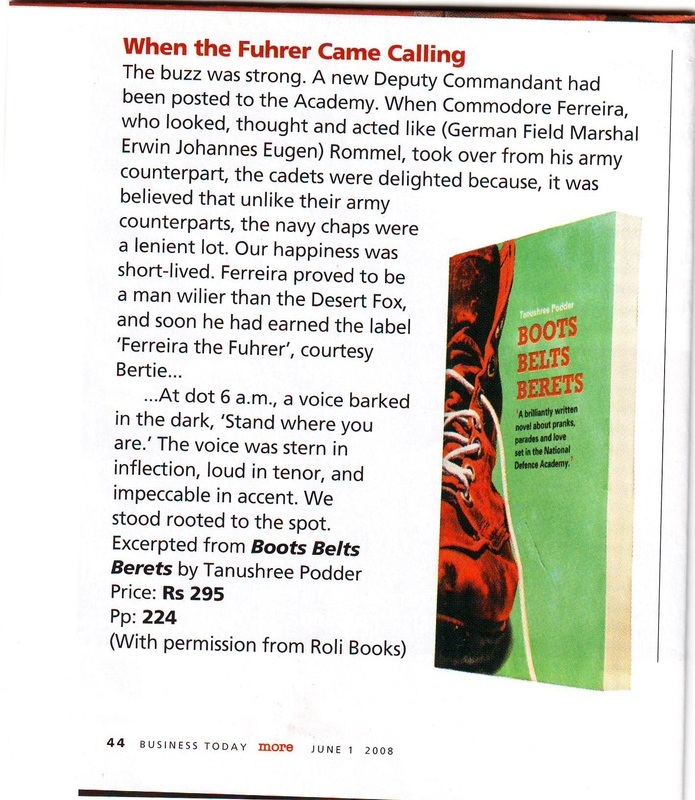 Boots Belts Berets is a story of guts, grit and determination. It traces the transformation of an ordinary youth into a considerate gentleman, yet tough and ready to face the challenges of life. The story is set in the 1970s when Pune was called Poona and Rajesh Khanna was every teenagers’ heartthrob. Nikhil Dutta, Albert Rebello, Randhir Singh and Manoj Mitra are thrust into NDA for various reasons. Though from different parts of India they begin to form an impregnable wall of friendship over the two years of their training. The boys have heard of the glamour and respect attached to NDA cadets but soon they begin to realise that life within the campus is not as colourful as to those eyes witnessing the academy’s colourful Passing Out Parades. From getting used to unthinkable ragging from their seniors to the punishments meted out by the ‘funny’ ustaads (trainers) they soon learn that life is not just about spit and polish but six terms of adventure and achievement. Far away from the comforts of family life each day becomes one to conquer. Despite the tough, disciplined life, they gradually realise that there is hope after all. They begin to have their own share of fun— from greenhorns telling stories of imaginary girlfriends, boasting about their sexual exploits, courageous attempts deflating their superior’s cycle tyres and boozing country liquor— they become tough soldiers. This saga skillfully presents the perfect case of how boys are ‘re-processed’ to become men of honour. 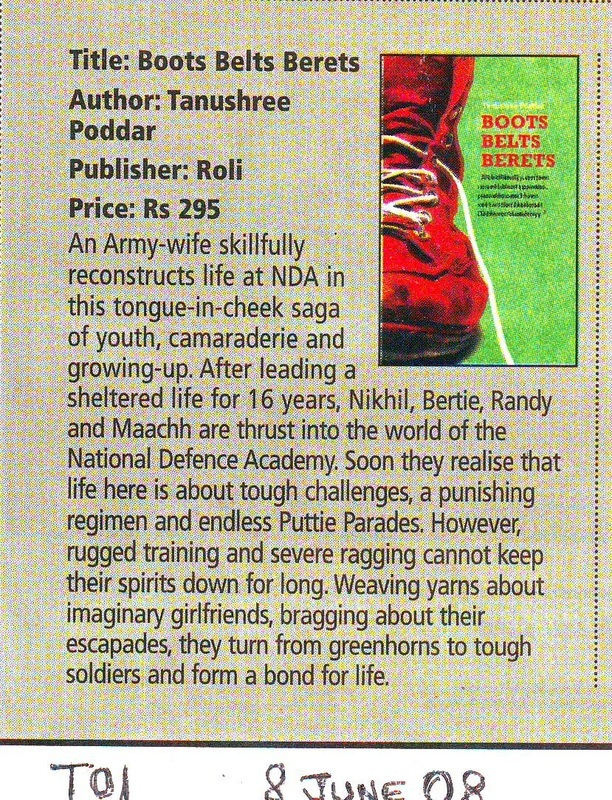 Tanushree Podder manages to bring out the youthfulness and adventure of life in the NDA. She also does a splendid job in displaying the humaneness of the cadets. Her style of telling stories is simple. The book is a must read for all.